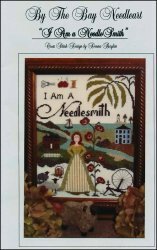 I Am A Needlesmith [W1802] - $12.00 : Yarn Tree, Your wholesale source for cross stitch supplies. Cross stitch pattern from By The Bay Needleart. A woman standing by a tall flower. Sewing notions, sheep, and a sail boat accent. Stitch count 120 x 152. Stitched on #4108 32ct Cotton/Rayon Antique White. This was an exclusive design for the 2017 Nashville Needlework Market.